I recently lost my dog, and my family and I found a new one to love and rescue. When we met her, she was favoring her right rear leg. The rescue said they were giving her an x-ray before she would be released. I put a deposit on her, as she is such a lovely little dog. she is some terrier mix. She jumps around like crazy though, but I cannot tell if it hurts her. She whines when I see her, but I think she is just so happy, that she cries. She was found on the side of the road in October, rescued, and brought to the vet. Apparently, she had a fracture and maybe no one caught it? Becuase this rescue pulled her, and she seems like she’s hurting maybe. She puts weight on it sometimes, but not all the time. They did the x-ray today, and are saying the leg did not heal correctly. From what they understand, the dog can live with this, as there is not much they can do. Suppliments…etc. I’m nervous to adopt her, but I also cannot possibly send her back. What would happen to her? Will I face thousands of dollars in vet bills? I talk to the person running the rescue tomorrow. Should I raise money to save her? I can’t possibly live with myself if she goes back into the “lot” of unwanted dogs, and gets put to sleep. Hi Mandy and family, welcome. Wow she’s had a hard start to life but what a lucky dog to come across such a caring and concerned human like you. Thank you for considering taking this pup home with you. Before adopting her I would want to see the vet’s notes. Can you talk to the vet? I would want to know where the fracture is and how it could affect her mobility in life. Only the vet can tell you this but if they aren’t a board-certified orthopedic vet, it might not be all the information you need. If you know that you will love her no matter what, then adopt her. Sure, you could be faced with vet bills and yes, the leg might have to come off if it gives her problems. If you adopt her, get her checked out by an ortho vet immediately. By knowing what you’re facing you can save the money to handle vet bills. Typically what we see here is that if a leg is beyond repair and it’s giving the dog problems, amputation will get rid of the issue altogether. The cost is usually less than $3,000 for a simple amputation procedure with proper pain management and anesthesia protocols. Being that she’s a small dog, it might be possible that even as a Tripawd she won’t have any major health issues too. You really won’t know until you get a professional opinion. If you aren’t sure you can cope with any vet bills that may come up, then is there any way you can have her on a trial basis? At that point you could take her to an ortho vet to find out the whole story. It will cost you up front but at least you’ll have all the information you need to adopt her. 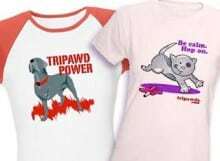 And if it’s any consolation, the Tripawds Foundation Rescue Fund will help a little. Our Rescue Reimbursement program will pay you back $100 as long as she’s adopted through a verifiable animal rescue charity. I hope this helps. Stay tuned for input from others in our community who have been through the same or similar issues. My Tess was also a rescue. The instant I got her home, I noticed a limp. She was two when I got her, and the vet said the leg had been broken in two places one year prior and never set by a vet. We sent her xrays to a teaching hospital. The recommendation was to do nothing. The leg was crooked, so she always had a slight limp, but the calcifications were strong. Rebreaking and setting it had no guarantee of improvement. You might also want to get a specialist to review the X-rays, especially since it is a more recent break. Arthritis is a risk later in life, but Tess never developed that. She did tear her cruciate when she was 8. She started supplements after the cruciate surgery. The tear might have been related to her gait, but so common in labs that it might not have been. She passed at about 10, likely of hemangiosarcoma. She was the sweetest dog imaginable. Although every case is different, I would adopt her again in an instant. The costs were no more than for an average lab. My only recommendation would be to not let your pup get overweight. Good advice generally, but also helps prevent problems, like arthritis, later. Each dog is different. Smaller dogs tend to do better with amputation. Be mindful to keep weight in check and everyone does even better if you do basic core strengthening exercises at home. My mother adopted a great Pyrenees that had a limp on her hind leg that was suspected of being a previous break that wasn’t set. When my mom had xrays done, it was actually a birth defect. Surgeon said to keep the leg unless she stopped using it. She never did. My mom had her on arthritis supplements immediately and that did seem to help. A friend of mine spent over $7k trying to repair a very bad break on her dog’s leg but no matter how many pins the vets put in, it just did not heal. Everyone was miserable so they decided to amputate. The next morning, her happy dog was back and never had any issues at all. She lived into her double digits. Amputation costs vary depending on where you live. If the amputation is due to trauma, there is normally no long term expense. I always recommend joint supplements but I recommend that to any dog that lives an active life. She sounds so sweet! I do hope you can find a way to make this work, as it sounds as though you’ve already developed a bond. Ditto Jerry, I would want to see the notes, so you know what you’re dealing with. If she is sometimes using it and sometimes not, it does suggest to me that she is likely in at least some degree of pain. Do you know if the fracture involved a joint? (if so, then arthritis is pretty much a certainty, and this needs to be borne in mind, when considering what the best options are now) When they say there is not much they can do, does this mean that they have not considered amputation, or that they have ruled it out for some reason? If she is in pain with an improperly healed fracture, that would seem (depending on her general condition, other joints etc.) a fairly straightforward and effective way of dealing with the problem. I agree that seeing an ortho now (and possibly a physio too) would be a very sensible step, and would pay dividends in the long run. Please keep us posted, and let us know how you get on. I do so hope that you’ll be able to take her.